By Visage and out of Holland Rose, this fellow has an international future ahead of him. 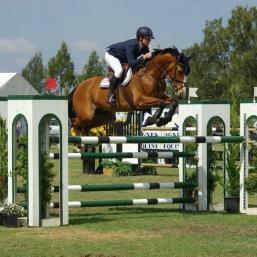 He is an outstanding type with flamboyant movement and an exciting jump. Half-brother to Cadiz, Verdi is in training at Redleaf with Tallara Barwick who also is joint owner, and she assures us he already has a faithful fan club. Recent Results: Melbourne 3-Day 2013, 3rd in the 1-Star with Tallara Barwick, 1st C Grade and 5th C Grade Final at Caboolture with Dave Cameron. NSW State Champion 1* Goulburn 2013. Competing at 2* in 2014 with ongoing success, as well as regular wins and places showjumping in Young Horse and Futurity classes.